• the first thing you will need to do is shrink your sweater. by doing this you will essentially create a thick piece of wool felt. and all you need to do to make that happen is stick a wool sweater in the washing machine using hot water and then dry it in the dryer (on purpose). we washed ours twice to really shrink down the fibers. • with a ruler draw on your paper two rectangles measuring 9 1/4 x 11 and 9 1/4 x 14 inches and cut them out to use as your pattern. 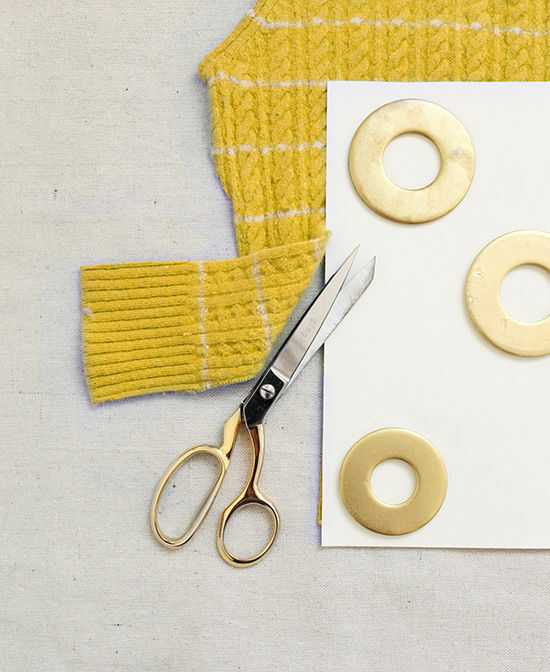 if you want a longer or shorter flap (which you may depending on the design of your sweater) add or subtract length to the basic 9 1/4×11 measurement to create the longer of the two pattern pieces. • because every sweater will be different in size, shape and design take a little time to plan out where to place your pattern for cutting. if the design allows for it we like to utilize the ribbing of the waistband to create the ends of the cover and flap. 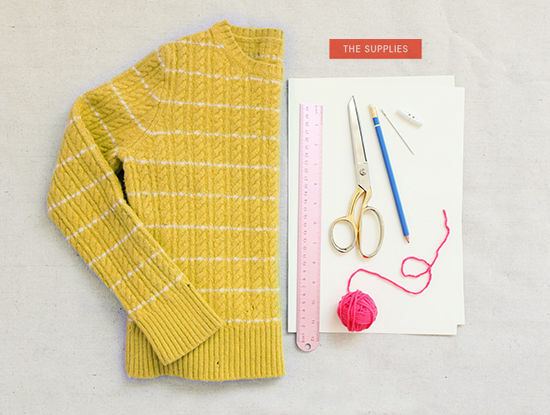 • cut your sweater apart so that you have a front and a back, it also helps to cut off the sleeves to be sure they’re out of the way and reduce some bulk. • lay your pattern down, one pattern piece per side. weight it down (you can use weights, canned soup, bean bag etc.) and cut both pieces out. • lay the smaller piece on top of your longer piece with the right sides facing in. align at the bottom and pin together. 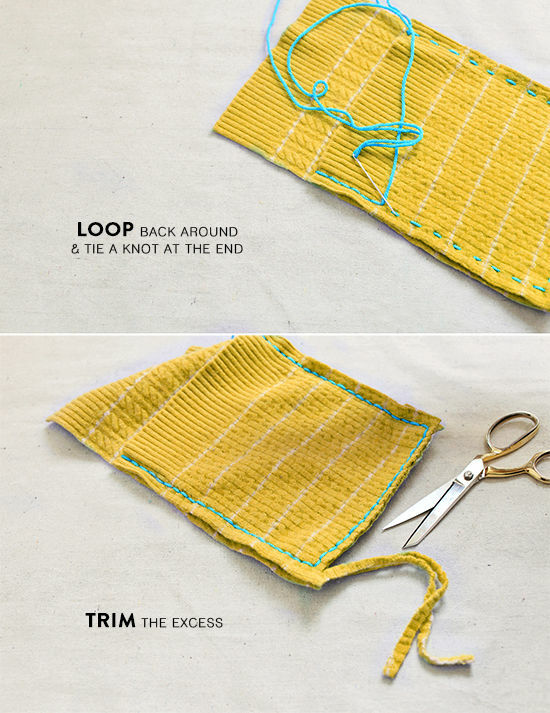 • this step is optional, but we find it helpful to use a ruler to lightly draw a line around the three edges to be sewn 1/2 inch from the edge with a marking pen on both pieces. that way when you’re stitching it’s easier to maintain a straight line. • using yarn and a yarn needle and starting in the top right corner stitch along the side, bottom and the other side 1/2 inch from the edge using 1/2 inch length stitches. • when you’ve worked your way all the way from one side to the other, loop your yarn around so that you can stitch your way back around to your starting point. knot and trim yarn. • trim excess of the sewn edge down 1/4 inch to remove bulk from the seam. • to secure the seam and to make it look neat, stitch around the outer edge from one side, along the bottom to the other side and knot. • next, turn your cover inside out, pull the flap over and with an iron on a high steam setting press the cover flat. when the sweater material is steam ironed you will be able to stretch the cover into shape easily. do this on both sides to really flatten and shape your cover. • sew the toggle button just under where the flap ends. • lastly, tie a loop that fits over the toggle button, slide it over the button and sew the loose ends through the flap to the underside and secure with a nice strong knot. presto! 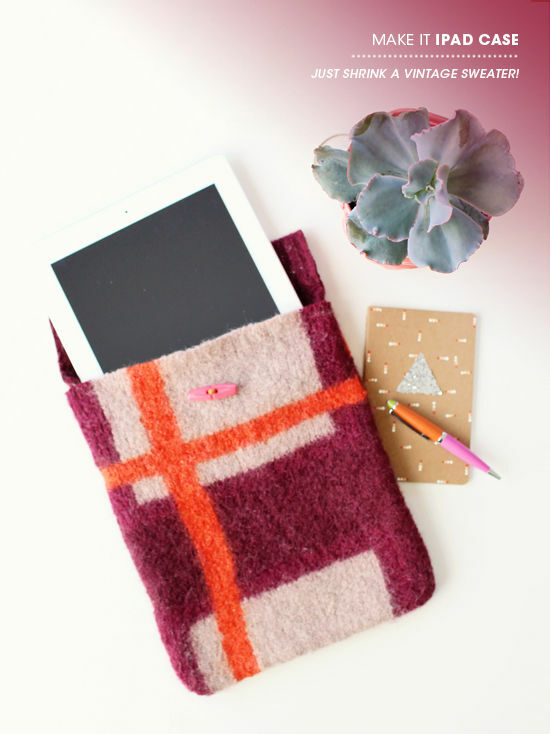 what was once a sweater from paris that i sadly had already shrunk is now a cozy ipad case. ***if you want to make a case for an ipad mini we recommend measuring your ipad and adding an inch to each direction to create a 1/2 seam on each side. we used the dimensions provided by Apple but found the device to be a little bigger than what they listed. so we suggest taking matters into your own hands and measuring the length and width for yourself. Awesome awesome awesome. I’m totally doing this. This is a genius idea! Wish I knew about it before Christmas but I will just have to make some of these for the Holidays this year! I’m in love with this! I will need to try this with a few of my devices! Thanks! What a great idea! And I bet some of the “ugly” sweaters would make the coolest cases! I guess my DIY to-do list is getting a little larger today! this is genius. i have been looking for an ipad case! These are so cute!! 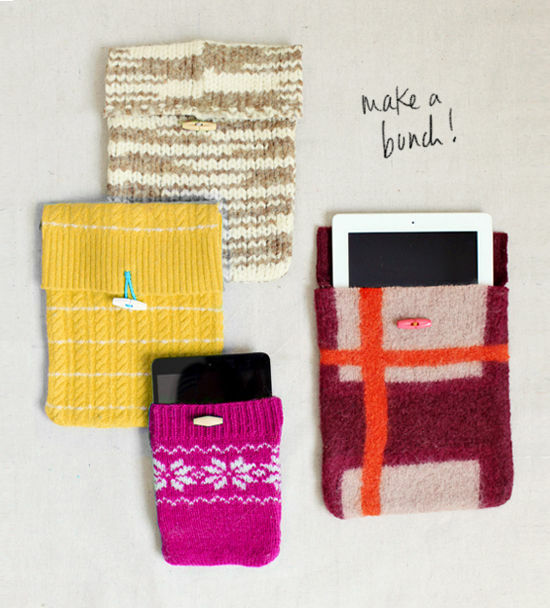 I want one for my Kindle. So cute and it looks pretty quick and easy! Thanks for sharing. I am very into this idea and will be making it asap! I started following you on instagram a while back, and i was sitting in lecture yesterday and noticed this post and was beyond excited (thanks for the distraction… lecture was a snoooze :P). Anyways, i went onto your blog this morning (for the first time) to check out the post, and holy smokes why haven’t i made time to do this sooner!!!! I went onto your pinterest as well to post this to my diy page to remember…. went half an hour later i have pretty well liked aaaaaaalllll you pinterest posts … ooooopsies. This is so cute, what I great way to personalize your tech. It’s always hard finding one that can match your style, so this is a great way to do it. I’m going to do this for my wireless iPad keyboard which needs a little extra padding for protection! ohhh this is so smart! i need to make one of my own soon! What an awesome project! I decided to make one as a Christmas present for a loved one. I just have one question – I’m worried that the edges on the flap will fray, is there anything I can do to prevent this? Thanks!